Happy 2019, ya'll! I seriously can't believe we are in 2019. I have a good feeling about this year! 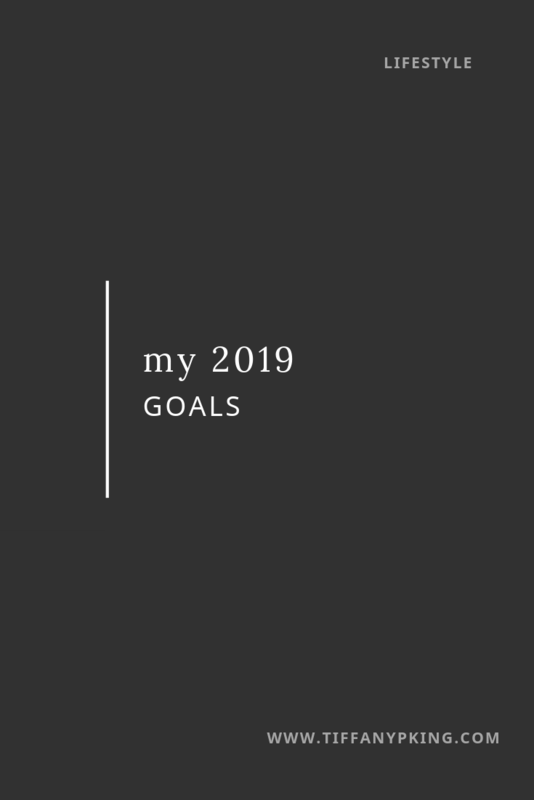 Anyways, let's get on to why you're here: to see what goals I've set for myself this year. I'm not gonna lie: I'm feeling pretty excited about this list, and I can't wait to see how these goals unfold by the end of the year! Goal One: Become a well-watered woman. This is inspired by Gretchen Saffles the creator of the Give Me Jesus journals and Well-Watered Women Co. (which used to be Life Lived Beautifully). This year, I want to be deeply rooted in God's Word, and as the Well-Watered Women website says, "to know Christ fully through the Word of God and apply the glory of the gospel to everyday life." I want to be a woman of prayer and pray for my family and life circumstances, and to put the Word before the world. January goal: Complete the Well-Watered Word before the World Challenge. Goal Two: Make my health (physical, mental, emotional) a priority. I told ya'll in the last post how my health took a hit last year and I spent most of 2018 just trying to survive. Well, I want to change that narrative this year and feel better. I want to serve my family well by being at my best, as I can't serve from an empty well). I want to be around and healthy for as long as possible for Eli (and other King babies), and I want to teach them healthy habits. January goal: Do a daily morning and evening routine. Goal Three: A marriage goal. January goal: Pray through The Power of a Praying Wife. Goal Four: Be a more intentional mom. I'm honestly still in shock that I am a mother to a 17-month old! Seeing how fast time flies, I want to be present for Eli’s toddler years; he’s growing so fast! As a lot of my business can be done on my phone, I can be on my phone a lot. I don’t want Eli to remember me as always being in my phone or him feeling like I love other things more than him. I don't want him to compete with my phone for my attention (sounds crazy, right?!) Therefore I'm using the hashtag #PhoneDownEyesUp (saw this on Instagram) to help me to remember my priorities. I also know that I have a responsibility to make a disciple of Eli, and I want to take that very seriously. January goal: Establish and stick to daily schedule for Eli (we've moved during Christmas and need to bring back some rhythm and normalcy). Goal Five: Live a simple and minimal(ish) life. January goal: Complete Emily Ley’s 30 Day Simplicity Challenge. Goal Six: Make home well and good. I want my home to be a safe space for my family in all aspects, and I want them to enjoy coming home and see it as a refuge. I also want my home to be healthy so my family can be healthy. January goal: Try another month of the Whole30 diet as a cleanse from all of that good holiday season eating! Goal Seven: Work His way. Ultimately, my work and business is God’s business and I want to steward it well. Goal Eight: More (passive) streams of income. This one is pretty self-explanatory! Mo' money, mo' leverage to pay off some debt! I'm also going to try to read 1-2 books a month. I used to love reading, and it's something that got away from me once I became a mom. So I'm picking this back up as a form of self care! The books I'm reading for January are The Power of a Praying Wife and Parenting: 14 Gospel Principles That Can Radically Change Your Parenting. Welp, those are my goals, folks! I think these tie in pretty well with my word for 2019. Did ya'll set any goals? Share 'em with me in the comments!